Eat, drink and be creative! These three Tri-State opportunities prove that you can do it all: have a glass of wine, spend quality time with your girlfriends and tap into your inspired side. Discover how your next girls’ night can take an artistic twist. When you and your girlfriends get together, you like to relax, have fun, and catch up over great conversation and a good glass of wine. Well, we have three ways to make that happen. 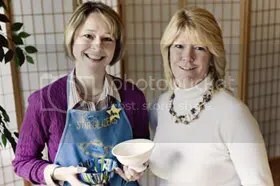 Several places around town get your creative juices flowing over some unpainted pottery that you can turn into your individualized masterpieces, but Star Glazers Owner Ann Flynn brings the fun to you. No need to worry about painting on your good clothes or going grunge in public. You can get comfy with your gal pals right in your own home as you select and paint a piece. And because you’re in your own home, you can cook up some hors d’oeuvres and pour a couple glasses of wine to share throughout the night. Star Glazers offers pretty much every piece of pottery imaginable, so before the pottery party, Flynn asks for a little direction for selecting the pieces to bring, whether that direction is a price range or style. Then the night of the party, Flynn brings a wide selection, and everyone gets to go shopping for the piece they’d like to buy and make their own. And Flynn is sure to bring plenty of each style in case multiple people have their hearts set on the same piece. Beyond the unpainted pottery, Flynn brings all of the tools necessary to turn the white “canvas” into a functional piece of art. Yes, she brings the glazes and paint brushes, but more importantly, she also brings inspirational books and supplies to turn even the least creative person into a seemingly pro potter. From foam stamps to stencils, Flynn has several tricks up her sleeve to help the uninspired find inspiration. After the party, Flynn gathers all of the pieces and takes them to be fired. Once the pieces are ready, she brings them back to the hostess’ house so that guests can pick them up. 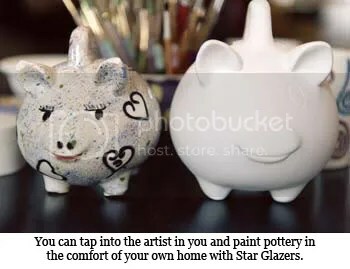 For more information about Star Glazers, check out >StarGlazers.com or contact Flynn at (513) 474-6364 or ann@starglazers.com.